Excellent engineering: Trail Designs Caldera, the best alcohol stove system, and the JetBoil, the best canister stove system. What makes these systems “best” is that they are fuel efficient, wind-resistant, stable and stow into a small package. Fuel efficiency (they both have heat exchangers to increase the percentage of heat actually transferred to the pot to boil water). For JetBoil this is a ring of fins on the bottom of the pot, FluxRing®. This increases the surface area for heat transfer—similar to a car radiator operated in reverse. For the TD Caldera, the entire pot and stove are enclosed in the heated Caldera cone. Thus the whole surface area of the pot, including the sides transfer heat. The cone also reduces convective heat loss (chimney effect) by trapping the heated air in the cone and a slowing the heated air from rising away from the pot. Stability (you can’t knock the pot off the stove, or easily knock the whole shebang over). Both systems lock the pot to the stove system so it can’t be knocked off the stove (a big problem with standard canister stoves). The wide base of the Caldera cone, and low height makes the entire system almost impossible to knock over. 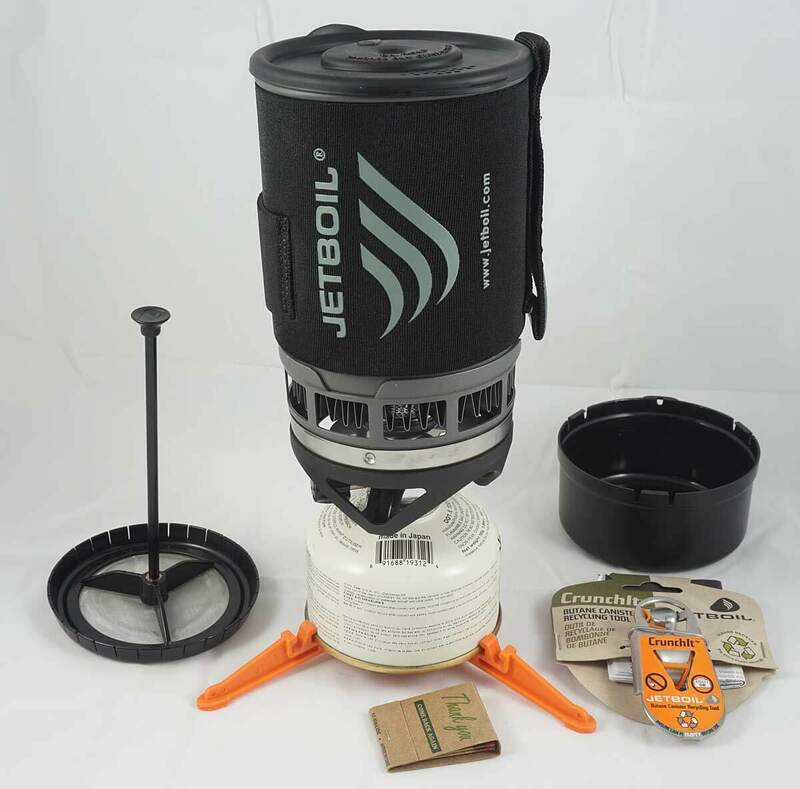 JetBoil provides a plastic “stabilizer tripod” that fits onto the base of the fuel canister, making it harder but not impossible to knock the the whole system over. Wind resistance The TD Caldera is the most wind resistant. The stove is completely protected by the Caldera cone. The JetBoil stove burner is partially protected by the FluxRing and a metal shroud at the base of the stove burner. In a strong wind it will loose efficiency. Below are the essential Pros and Cons for each system. While I clearly prefer the Trail Designs Caldera alcohol system, there’s no wrong choice. They are both good cooking systems. Systems compared are for two people for a long weekend. See below for all the gritty details. Trail Designs Caldera Cone system. The entire pot and stove are enclosed in the extremely wind-resistant and heated Caldera cone. Thus the whole surface area of the pot, including the sides transfer heat. The cone also reduces convective heat loss (chimney effect) by trapping the heated air in the cone and slowing the heated air from rising away from the pot. Clockwise from bottom left: Zelph “StarLyte Burner with lid,” fuel bottle with measuring cup, 900 ml titanium pot sitting on the Caldera cone, camp spoon and matches. Pros: light, exceptionally stable & wind resistant, fuel efficient, can easily get cheap alcohol fuel almost everywhere in the world, take only the fuel you need, no canister disposal in waste, wide pot easy to cook in and easy to clean. Ti cone has option to burn wood. Cons: more fiddling to set up, slower boils than canister stoves, initial learning curve, not available at major retailers. Note: although the TD “12-10 burners” are good, the ideal stove/burner for this system is the Zelph “TD Kojin Stove.” See below for more Caldera options. Comments: not as “efficient” as claimed when canister weight is considered. About 50% of of the canister weight is the metal can and not fuel. * Lower cost Caldera systems with similar weight and performance are available. The system above is the titanium Ti-Tri Sidewinder Cone, which supports alcohol, Esbit, and burning wood fuel. The pot is also titanium. 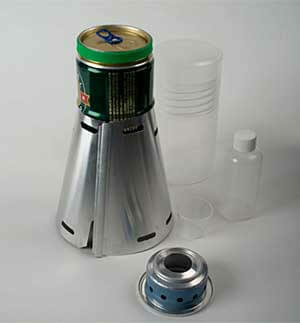 An aluminum dual fuel (alcohol & Esbit) cone and aluminum pot option costs $55 Caldera Sidewinder Solo. If you already have the pot the titanium Ti-Tri Sidewinder Cone is $80 without the pot. 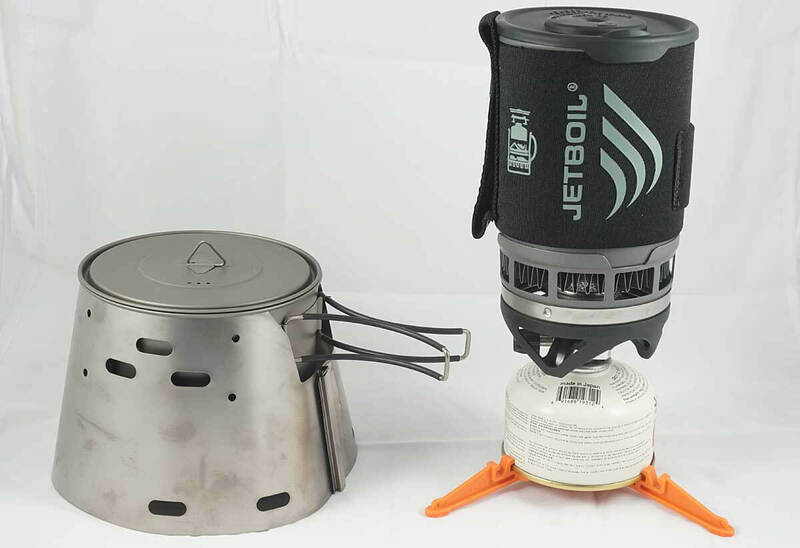 JetBoil Zip: The JetBoil is the best selling backpacking stove of all time. Most people just take a liking to it at first glance and never look back. It’s easy to use, boils water fast, has an appealing slim form, and has that wow-cool-gizmo! factor going for it. Clockwise from lower left, french press option; JetBoil pot, burner, canister, and stabilizing tripod (orange); pot base cap/cup (black), CrunchIt canister recycling tool. A friend’s stash of partially used fuel canisters that do not have enough fuel for another trip. 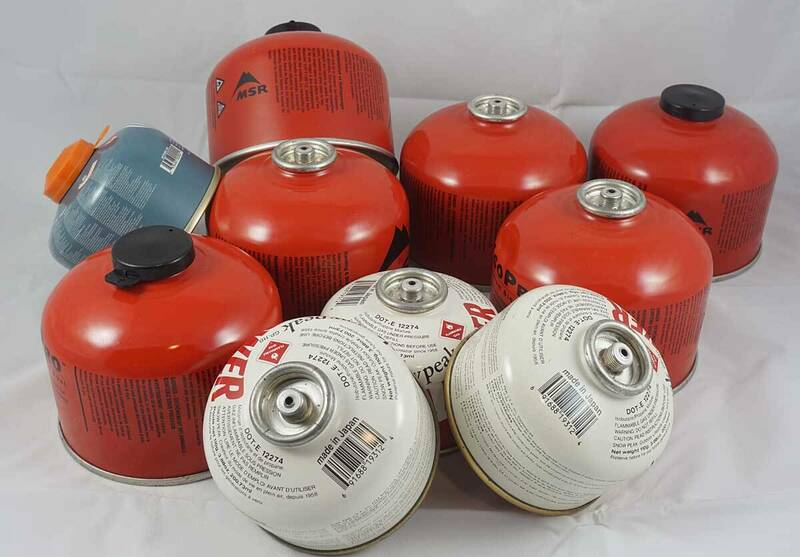 It will take hours of outdoor fuel burning and then canister puncturing to keep these out of hazardous waste. Both stove systems stow into a small and compact package. The Trail Designs Caldera on the left; the cone is rolled up in a white sleeve and has the fuel bottle stored inside. Stove (green), lighter, spoon and fuel measuring cup all fit in the pot. Which Stove is Best for You? Alison and I and most backpackers we know prefer the the Trail Designs Caldera alcohol system. It’s half the weight of the JetBoil and greener with no partially used fuel canisters ending up in waste. Alcohol fuel is readily available worldwide. We have no difficulty using the Caldera. One of the advantages of the Trail Designs Caldera is that I can light it and leave it unattended to boil water while I perform camp chores. It is near impossible to kick over. It is almost impervious to wind—remaining fuel efficient even unprotected from strong wind. In about 7 minutes, when I’m done setting up camp, I come back to boiling water for dinner. But my guess is that many readers will still end up getting the JetBoil canister system. 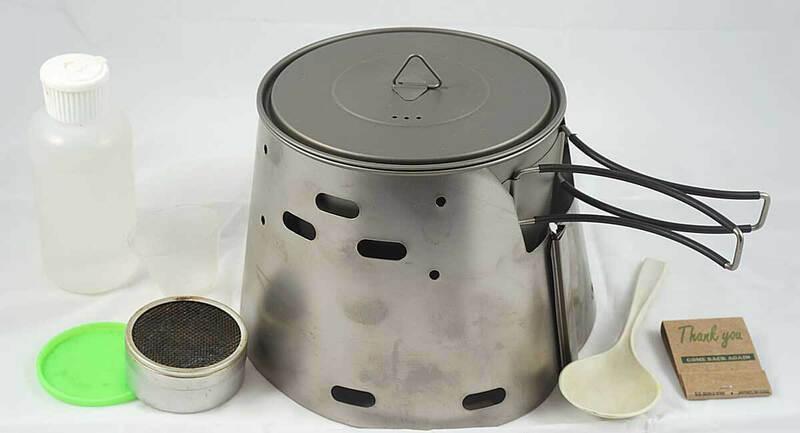 It is the best selling backpacking stove of all time. Most people just take a liking to it at first glance and never look back. It’s easy to use, boils water fast, has an appealing slim form, and has that wow-cool-gizmo! factor going for it. Unless you are a details maven, you need read no further. You have all the information you need. *Note: ~0.4 oz-wt alcohol vs. ~0.2 oz-wt propane/butane fuel for a boil. This is because alcohol has 1/2 the energy per weight of propane/butane. So it takes twice the weight of alcohol to boil a pint vs. propane/butane. Alcohol does not require a heavy metal canister for fuel storage, and has a lighter stove. So in the end, alcohol is the lighter overall system. No need to “estimate” how much alcohol fuel to use for a boil. Use a bit more (20-30%) than you’ll need & when the pot boils, blow the stove out & cap it (when cool) to save unused fuel. Brilliant! Optional Fuel Container This Twin Neck Fuel Bottle (1.2 oz) both stores and measures fuel. Standard quart container of Denatured Alcohol. Available in the paint section of most hardware stores, Home Depot, WalMart, etc. Alcohol Fuel Sources/Options Denatured Alcohol (aka clean burning marine stove fuel, methylated spirits, shellac thinner, liquid fondue fuel, chafing dish fuel). It is available world-wide in hardware stores (and in the US at Walmart or similar stores). In many countries like France it is sold in grocery stores as a fondue or chafing dish fuel. 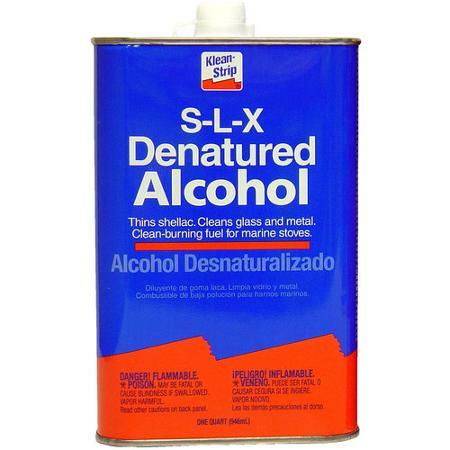 First choice in US is Klean-Strip Brand, likely labeled S-L-X “Clean burning fuel for marine stoves.” But I have used many other brands of denatured alcohol with no problems. In a pinch, you can use HEET (Yellow label, not the Red label HEET) which is sold at all auto-supply stores and many gas stations and convenience stores like 7-11. HEET works fine, but has more residue than plain alcohol fuel. Pot Cozy Anti-Gravity-Gear Pot Cozys are lightweight and efficient cookpot insulators which allow you to save fuel. The cozy traps heat, so food continues to cook long after you have taken the pot off the stove and will keep it warm for nearly an hour. Especially useful for hydrating meals. Trail Designs KEG-F. In an essential/stripped-down mode, the whole setup weighs around 3 ounces. For Going Really Light! For soloing I take a stripped down version of the Caldera Keg-F Stove System. The stove, windscreen and pot are around 3 ounces! Since this was written, another factor to consider, is that there has been some changing views on the fire dangers of alcohol stoves and the fact that they may not even be permitted in some areas. It’s tough to balance with the canister stove recycling issues vs the increased wild fire dangers and prohibition of non canister stove systems. Seems like a topic that should be included in the discussion when you update this page. Also, for UL cooking systems, it seems like the canister/BRS3000 and homemade wind protection (like a sit pad or finding a spot with rocks/trees) has become the gold standard vs the Jetboil. 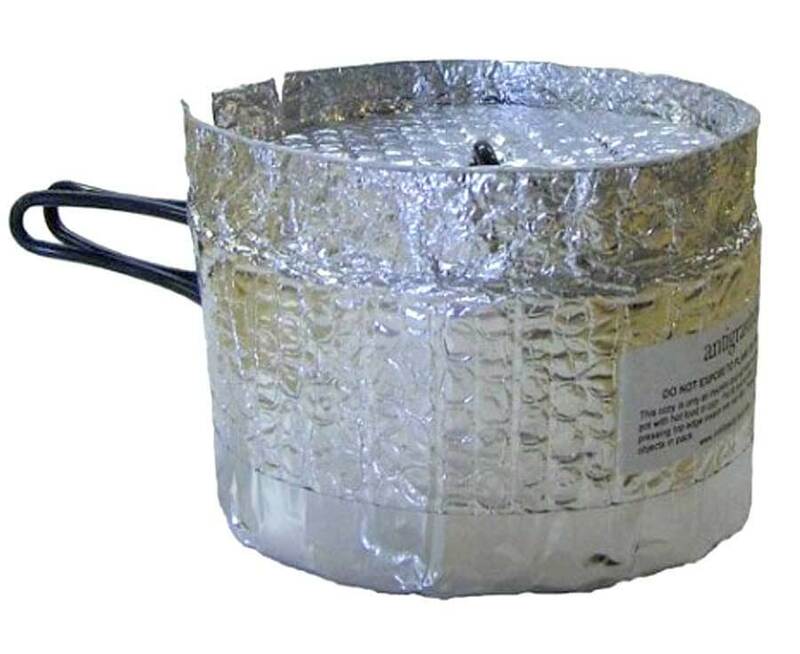 BRS Stove 0.88oz, Toaks 550 mL pot w no handle 1.5oz, DIY foil lid 0.1oz , 4 oz fuel canister 7.4oz, pot grabber–use buff or gloves, wind protection 0 oz for a total of 9.88 oz which allows easy boiling of water for re-hydrating meals. Thanks for all the great info on your site! Sorry for the late reply Brent. Yes, with hotter summers and more fires in the West, Parks are going to look at ways to reduce fire hazards from backpacking stoves, no doubt! But FWIW I don’t think that the Kojin, TD is any more of a fire risk than a canister stove. Case in point, I know that SEIKI that has very strict fire restrictions but does allow alcohol stoves. They consider them in the same category and canister stoves. And FWIW the Kojin stove can be put out just as easily as a canister stove. You can blow it out like a birthday candle and cap it, essentially reducing it to a non-burning fuel container no different than a canister stove. And once the fuel is in the stove, even uncapped it will not spill. That being said, you must ALWAYS comply with park regulations. My brother and I are walking for 6 days on the AT the last week of October. How much alcohol fuel would you take for trip of this length? I am thinking 14-16 oz.. I have a homemade kit weighs 10oz, I use a zelph stove. I also thinking of using my pocket rocket with a small canister kit weighs 14 oz.. Awesome info here, thanks so much for putting it together! – how do the trade-offs change when cooking for two, and heating up 1qt in a GSI tea kettle, for example. Does that take forever in a caldera cone? – is it at all feasible to saute something on an alcohol stove, or does it only really work if everything is well closed? And the diameters of the cone&pot/pan/kettle are perfectly matched? – I see that TD has simmer rings for the 12-10, do they work and are they worth it? First, Alison and I use a 0.9L Toaks pot on the Caldera using the new Kojin stove. It does everything we need it to do. We have no issues cooking dinner on it or boiling water for coffee in the morning. Boil amounts range from 500 ml to around 800 ml. Since the pot can be set to boil unattended, we are doing camp chores while the water gets hot. As such, a 6-10 minute boil time is not an issue. Calderas are always matched exactly to the diameter of the pot. And altho we never simmer for an extended period with any pot, we occasionally do simmer for a few minutes to fully hydrate a meal. In this case you do need to keep stirring so that food doesn’t stick to the pot bottom. Given this, I would guess you could manage a simmer for a while assuming that stir continuously. I have never used the simmer ring on the 12-10 but have faith in the folks at TD. If they make a simmer ring then it likely works. Finally, I am just wondering what your interest in simmering is. For the most part, people interested in ultralight stove systems are usually interested in boiling water and either do cook-in-bag meals, or like Alison and I might do a 1-2 minutes simmer after boiling to complete hydration. That is, these ultralight systems are not designed with gourmet trail cooking as a first priority. > I am just wondering what your interest in simmering is. Good question! Wanting to pack light doesn’t necessarily mean one has little time to cook. I was thinking about a risotto, for example. It’s light, easy, tasty. Also, it can be nice to stir the pot for 30 minutes while it cooks. But I assume the real issue it the fuel weight this adds. I’ve been reading more about the fire restrictions in California and that is seriously dampening my excitement about alcohol stoves, sigh. I think better gas options have become avaliable since this was written, the msr wind burner for example has a regulated burner and is as impervious to wind as the caldera (I own both). Thanks Alan the wood thing looks like more time and work. I have a small light weight alcohol kit that works great. Really like your website! I have used your advice a lot, my pack is so much better. I have done some research on the solo stove and was wondering your thoughts on using a wood burning stove? I think the best feature of the cone, if its titanium, is the ability to burn wood if out of alcohol. Best feature of an alcohol stove is, IMO, the easy of finding fuel. Drug store, grocery store, hardware store, camping store. Ditto on the compliments for the great site. I also have a range of stoves and vary depending on the trip and companions, including trips with my children where I might do more ‘interesting’ food. I find I often use the Solti pot with the newer Jetboil stove that has the regulator, but have swapped the cup for a Toaks 400 ml cup that fits on the bottom of the stove – I can have coffee in this while meals are cooking, or more water is on the boil for freezer bag cooking. I think I read somewhere that the Evernew cup fits a little better. If travelling with one of my children, they might have a small titanium frypan to eat out of but also to offer options like omelette in the morning. Of course, all of these are options with wood, alcohol or Esbit stoves but I must admit if carrying the kids gear I usually have less energy to ‘fiddle’ with cooking. I find that the choice of meals for a trip and how many are being cooked for directly influences cookware, but also inevitably the stove option . In any case, it is important to consider that any additional participants in the meals should add flexibility to cooking options by using additional cookware options where appropriate, rather than just eating. Of course those options must fit with the stove choice and other requirements such as expected fuel usage and environmental considerations such as weather, shelter and altitude to cook your meals. I think you have successfully pointed out that there is no one size fits all approach. The Caldera Cone System comes with the 12-10 stove. If I go with your suggestion to use the Zelph StarLyte instead, any thoughts on what to do with the 12-10? Or can I save a few bucks and keep the 12-10? This will be my first alcohol stove, so I don’t have a reference point. Thanks for your advice. 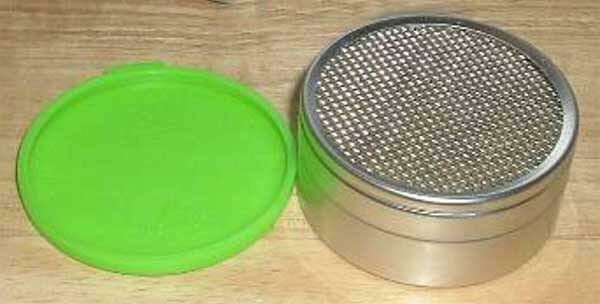 Do you find that fire restrictions affect your use of an alcohol stove? I am trying to decide whether to buy a Caldera or a Jetboil. Coming from Southern California where there is ongoing drought, it seems that alcohol stoves are not permitted in many forest areas. Per the PCTA website (http://www.pcta.org/discover-the-trail/backcountry-basics/fire/) it looks like many fire restrictions are much more lenient towards canister stoves. I always leave out with a full can and save the partial full can for car camping. Some through hikers on tight budgets appreciate these as donations. Avoid leaving very empty cans in donation because this is more of a problem than a help. Please be considerate. Sounds like a good idea. Only comment is that the propane usually burns of faster than the butane. So guessing that after a few transfers you’ll have mostly butane and little or no propane. Not the end of the world. A great competitor to the JetBoil is MSR’s WindBurner. It’s essentially the same weight, does MUCH better in the wind, boils faster, holds heat longer, and has an overall “built well feel”. Having used both, I’m sold on the WindBurner. As for the canisters… It’s probably not the best UL thing to do, but I’ll typically bring 2 canisters when I know one is close to empty. I record the weight after every trip in marker so I have a pretty good idea how much fuel per day I’m using and whether said canister needs a backup. Once empty, the crush-it key from JetBoil works like a charm. Alan, I have and use both. (Caldera Cone/Kmart Grease pot ~7oz, Jetboil Sol Aluminum ~10oz) For short two and three day trips, I prefer the alcohol stove. For 4-5 day trips it really doesn’t matter. For up to 11-12 day trips I usually bring a canister. This is the max I can go on one 230gm canister. For longer, I go with an old WG stove that weighs about 17oz. I agree completely, half full canisters are NO fun. The Caldera sheet metal cone is nicely designed but has sharp edges which could cut you or cut fabric. Spend 3 minutes sanding the edges with medium grit sandpaper and it will make it much smoother. A point of clarification: the Jetboil Sol Ti is still available on Amazon even though it’s been discontinued by the manufacturer. The melting issues as I understand were occurring because people would start the stove without first filling it with water! Very silly to do with any stove but with titanium the abrupt expansive forces will snap the fins off of the base. It’s unfortunate when good (in this case great) products are dropped because people don’t use them properly. Without the legs and soup cup (both unnecessary) mine is in the 8 oz range (plus fuel). I used to carry a fancy feast alcohol stove but have found that the Jetboil system with canisters actually weighs less on trips of more than three days due to the much energy density of isopropyl. That and I can boil ~3-4 cups of water in the same time as 1 using alcohol. +1 on the partial canister comment. Although a very accurate estimation of remaining fuel can be made by measuring full and empty canister weights then interpolating the current weight. I am planning a CDT thru next year and I want to take my TriTi with me, but I am concerned about burn bans prohibiting alcohol stoves on one hand and the logistics of refueling canister stoves on the other. So I was wondering if I could find a compromise. I was thinking I would supplement TriTi with a tiny canister stove (like a MSR Pocket Rocket), using the canister inside the cone as a windscreen/pot stand if and when burn bans affected me. To keep pack weight down, I would not carry the wood-burning kit with the TriTi, relying on alcohol, with the canister as my backup fuel, to cook. For your TriTi look at Swissmar F65300 Fire Gel. Some users have made the call that this does not qualify as an alcohol fuel and have used it during burn bans. And because it is a get it does not easily spill, see this Video on Swissmar. Obviously you’ll need read the reg’s and make your own call on whether this complies or not. I cannot personally recommend that you use the fuel during a burn ban. using a canister in a the TD is not a good idea. It will heat the canister up, potentially causing it to explode. Canister stove operating instructions explicitly forbid using the stove with any sort of windscreen around the canister for exactly this reason. Alan, thank you again for your priceless site and valuable feedback. I’ve been doing a lot of research – two years worth. My Ti-Tri Sidewinder w/ Toaks has been ordered and should be in the mail any day now. I’m curious as to why you didn’t make much–if any–mention of Esbit/hexamine? Is it just that you prefer the ‘Greener’ fields of denatured alcohol, or am I missing something? Nothing wrong with Esbit. It is ligher than alcohol (same energy/per weight as canister fuels–so double that of alcohol). I personally find the Esbit smell slightly nauseating and it puts me off my feed for dinner which is why I don’t use it. But others do not feel this way. I noted that you use the original Zelph stove instead of the “modified” Zelph stove which is supposedly better-suited for use with the Caldera system. Any particular reason? The mod’ed burner was created for low volume, small diameter pots like the SnowPeak 600 ml mug, and beer can pots. It has a smaller concentrated flame for the smaller bottom of these pots. And because you aren’t boiling all that much water the slower boil time is not as big a deal. While I do like alcohol stoves, I have recently been working on backpacking dinners (curry chicken, chicken alfredo, beef stew) that require some simmering to come out well. 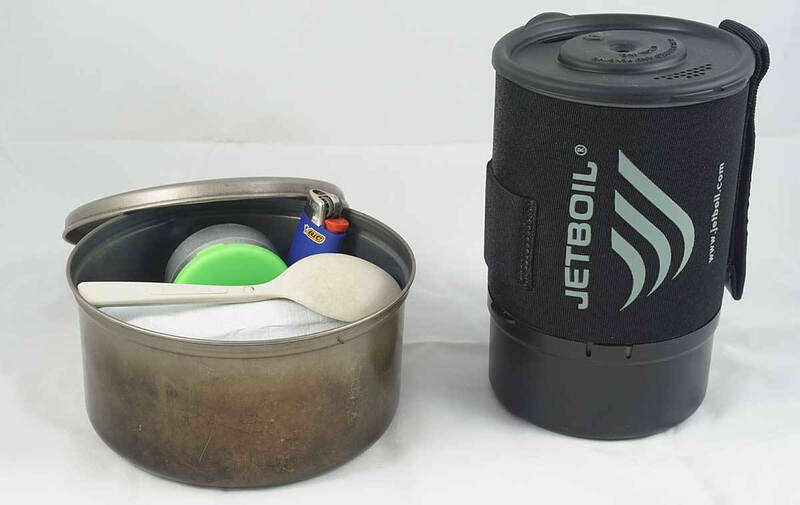 For me the JetBoil Minimo at a fairly light weight (14.6 oz) (personal base weight is nearing 8lbs) does the trick. Also found it on sale at $90. So I am willing to sacrifice some weight to be able to boil water for coffee, and simmer my slightly better than most option dinners. Just a thought and it has taken me a ton of time to figure out how I want to eat while hiking. Good info. I am only about 8 trips into my JetBoil Flash. I love the efficiency and speed and the only concern is that the piezo igniter is not that reliable (I am afraid it will fail totally and soon). I am reading up on the igniters and they seem to be a problem for others, too. 3) The quoted price of $120 includes the pot. That’s a fair thing to bundle into your price as you’re comparing it to the JetBoil that includes a pot. To your and Jeff’s comments, the pot and the cone are titanium, and as such come in at a slightly higher price point. The system is also available without the pot for $79.95. All good points Rand. Will revise accordingly. Have both, love both. Have had no problems with either. There is no determining factor as to which I’ll use during an outing, but I do like the increased speed at which the Jetboil operates. Sometimes hotter faster is what I want…….. Plus the ability to fry is so much better using my Jetboil…….. And I haven’t any problem with the empty canisters. And yes, I do use them up, if not on the trail, then I use them up in the field during working hours, or simply by having a cup of coffee in the backyard. Puncture the empty and toss. And I never leave the country so not finding fuel has never presented a problem for me ……… yet. But in all honesty, most times I lollygag about and don’t mind just hanging out with my Caldera Cone. Plus, which is a big plus, no noise to speak of….. love that. No jet fighter noise to deal with. So comforting….. Late in the evening, or up early in the morning boiling water for my cocoa, coffee, or tea…… just listening to the wonderful world in the wilds. I probably use my Caldera Cone close to 70% of the time. Thanks Dave, my experience as well. I either have the time for the Caldera to boil, and/or I have plenty of camp tasks to do. I rarely, if ever have lost time waiting for a boil. Quiet is good. It’s certainly possible, maybe even probable that Jetboil is playing games with advertised weight. I usually leave the tripod at home, and I don’t find stability to be a problem with the shorter Sol. I’ve heard some people also leave the bottom measuring cup/cover at home, and use something lighter for the lid. Of course, that goes beyond the scope of your discussion. I would worry about the Titanium fins being unprotected in light of reliability reports, but maybe I could see leaving behind the bottom cup with the Aluminum Zip or Flash Lite. >My biggest gripe with any canister stove is the collection of half-full fuel canisters which I am somehow loathe to take on my next trip. You can lighten your JetBoil significantly by picking a different model. Although it has now been discontinued, the JetBoil Sol Ti is my all time favorite. I don’t have direct measurements handy, but online search quotes the Sol Ti weight at 9.9 oz minus canister. That puts it within competitive range to the Caldera Cone. I think they discontinued the Titanium products due cost as well as reliability issues (online reports of the heat exchanger fins melting off the cup). The current JetBoil Flash Lite has a quoted weight of 11 ounces. I also found the boil time of the Sol Ti to be on the low end of the 3-4 minutes you quote. When boiling water for 2-3 people, the fast boil time made a big difference, especially for the person who was last in line to get their water boiled. Thanks Jeff, good point that fast boil times are certainly a major strength of the JetBoil. Especially when boiling large amounts of water as you point out. And yes, sad that the lighter JetBoil Systems were discontinued (altho even at 10 oz the whole system would still be almost 1/2 pound heavier than the Caldera). I carefully weighed my very current JetBoil Zip in at 12.5 oz. That included the tripod, pot lid, and bottom pot cover. Possibly JetBoil is not including those on their spec’ed weight?